There are few women in the public eye who I find lovely, and even fewer whom I admire, but Kate happens to be one of them. She seems to handle her newfound role with the grace and elegance of women like Grace Kelly and Audrey Hepburn and continues to wow me with her modest yet fabulous sense of style. 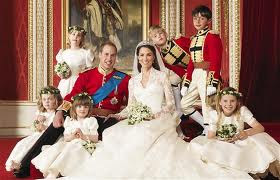 My husband and I both woke up in the wee hours of the morning to watch their wedding, and I found it to be a most exquisite, yet simple affair (for Royal standards, that is), which made me admire now-Duchess Catherine even more. It prompted feelings of wanting to get married again (to the same husband of course, my own Prince) due to the resplendent beauty of the entire ceremony. If you're one of the 3 people worldwide who have not seen it, or if you (like me) want to take a looky-loo again, I've posted the hour-long ceremony. 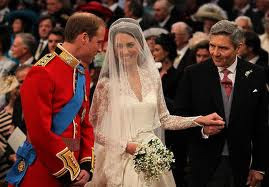 Happy Anni William and Catherine. May you have many long and happy years together, growing in love and patience with one another.